• Bead breaking Wedge: Convex shape wedge penetrates the tyre bead effectively. Groove on the convex shape creates easy passage for the tyre lube into the bead. • Sledge edge: A hook to drag the tyre into position Indestructible handle is made from spring steel bars that runs through the handle. Bars are locked with the hammer head using steel locking plates ensuring that the head never gets dislodged Ergonomic rubber grip handle absorbs vibrations & reduces fatigue Special bonding process ensures that the head never gets loose from the handle. 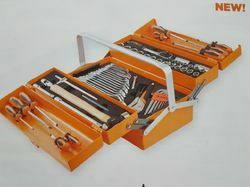 Looking for Groz Tools & Equipment ?